Casper Insurance offers free, comparative quotes from multiple insurance carriers so you can get the best possible rate. Want to see how much we can save you? Just request a quote to find out. At Casper Insurance Agency, we represent a carefully selected group of financially sound, reputable insurance companies, and our agents place your policy with the company offering the best coverage at a competitive price. With an independent insurance agent, you have choices. Our agents are not tied to any one insurance company. One of the advantages of using this is that he or she works to satisfy your needs. You are using an expert for an important financial decision. 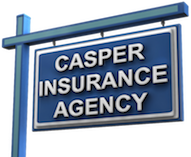 We at Casper Insurance Agency do not work for an insurance company; we work for you. We work on your side when you have a loss and follow through to see that you get fair, prompt service.